John Costin is so deserving of the Award of Merit that ArtFest judges bestowed upon him in 2016. He meticulously studies his subjects in the field and then goes to work recreating them from memory. We hope you met him and experienced, first hand, the incredible artwork of this extraordinary printmaker. 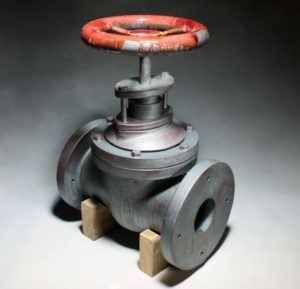 Michael Schwegmann creates amazingly detailed ceramic representations of common items that reference labor and hands-on activities. He won the 2nd Place 3D Award with these special wheel-thrown and hand-molded pieces at ArtFest Fort Myers 2016! See more at Schwegmannstudios.com. Garry Seidel produces each of his images using traditional film and darkroom printing processes. 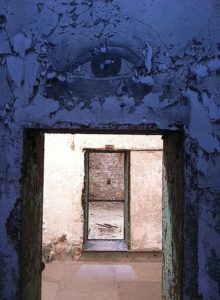 His photography reflects his life happenings – notably, his experiences with his family in war-torn Berlin, Germany. The judges awarded this stunning insight on life by awarding him the 2nd Place 2D Award at ArtFest Fort Myers 2016! Kristin Thorsen applies her heavy influences of contemporary European teachings and Scandinavian heritage to her artwork. She has knack for spurring our imaginations as she takes us away into her invented cityscapes within her paintings – surely she deserved the 2016 1st Place 2D award! 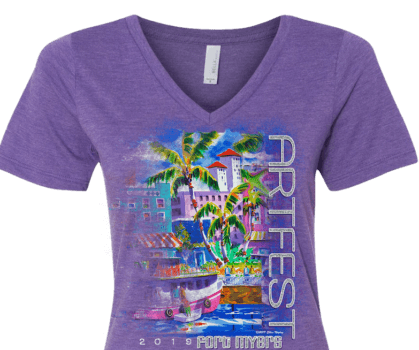 ArtFest Fort Myers, Southwest Florida’s premier fine art festival, is pleased to announce the opening of the Poster/T-shirt Competition for the 2017 festival! 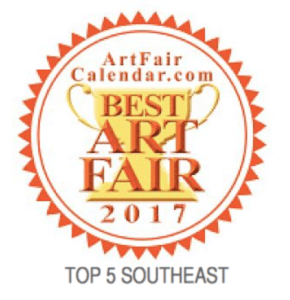 “We hope that all professional artists will submit artwork that speaks to Southwest Florida,” explains Sharon McAllister, Executive Director. 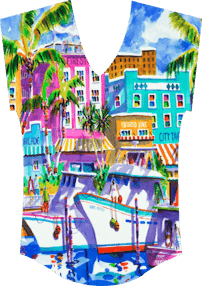 “Our Commemorative Poster and T-Shirt always feature inspiring original artwork and we encourage any artist, not just those applying to participate in ArtFest Fort Myers 2017, to submit their artwork for consideration. 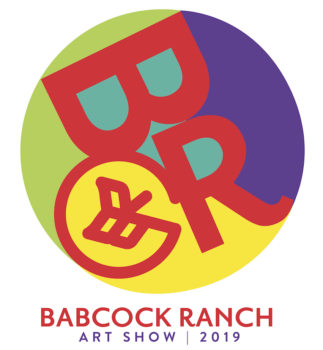 The artist whose work is selected for the Poster/T-shirt will be featured in a broad range of print, on line and VIP promotions preceding festival weekend, and continuing throughout the year. 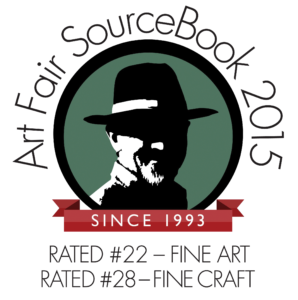 The selected artist also receives a free booth space at ArtFest Fort Myers 2017, a complimentary three night stay at our host hotel, plus an invitation to join us at ArtFest Fort Myers 2018 and much more! 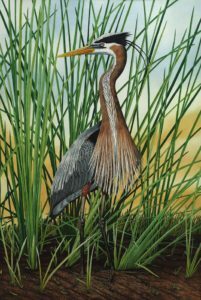 Submissions for this contest must represent original artwork, in a theme that reflects Southwest Florida and is appealing to a broad audience. 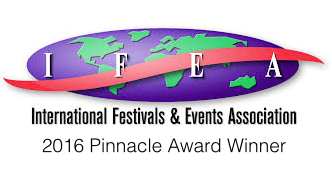 Entries are being accepted from May 20, 2016 through August 19, 2016 and images can be submitted by email. 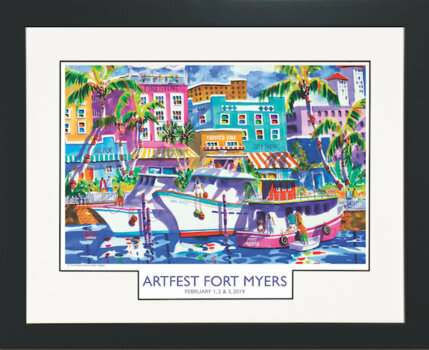 For more information, visit our web site ArtFestFortMyers.com and click on Poster Contest or call 239-768-3602. 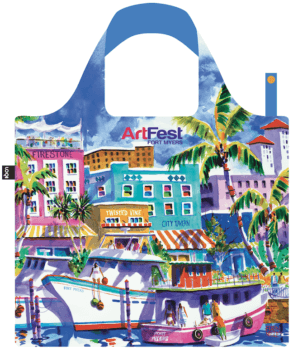 Proceeds from the sales of the Commemorative Poster and T-Shirt help to support a variety of ArtFest Fort Myers’ art education outreach programs and the Newspaper in Education Program at The News-Press. 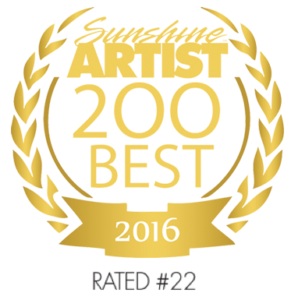 ArtFest Fort Myers, Southwest Florida’s premier fine art festival, is currently accepting applications from professional artists for participation in our 2017 juried show. 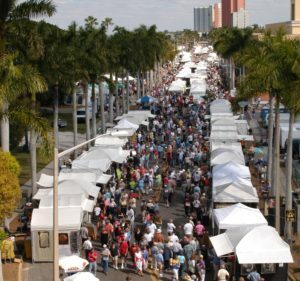 Featuring the work of 200 artists, ArtFest Fort Myers will bring 85,000 art lovers and collectors to the largest outdoor gallery in Southwest Florida on the first weekend in February! 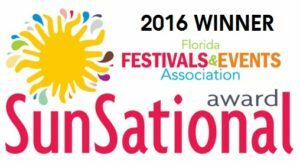 Why apply to participate at ArtFest Fort Myers? Creating an artwork-selling festival for artists is the focus of our year-round professional staff, with 17 years of consistent management. 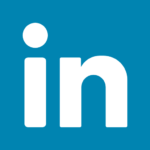 Targeting art buyers throughout Southwest Florida and beyond – from Marco Island to Sarasota and east to West Palm Beach – our promotional campaign includes all forms of media. We also understand the importance of providing great artist amenities over festival weekend, to ensure that our artists are stress free and ready to share their work with our dedicated attendees. 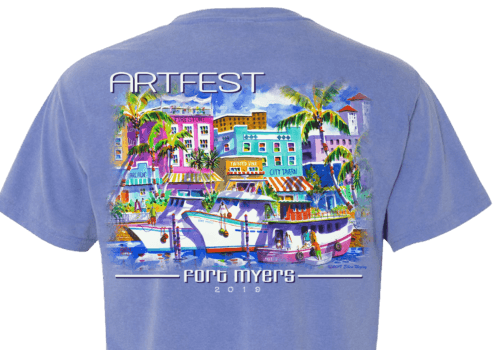 For Artist Application information, contact ArtFest Fort Myers at 239-768-3602, email info@ArtFestFortMyers.com or visit our website at ArtFestFortMyers.com. 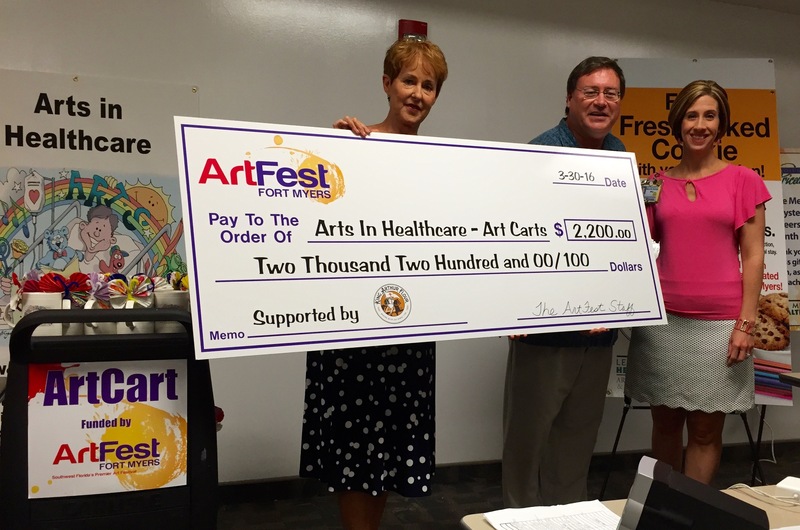 Dedicated to providing art enrichment to our community, ArtFest Fort Myers is particularly attuned to supporting art education programs. This season, the fine art festival found a unique and exciting way to contribute to Lee Memorial Heath Systems “Arts In Healthcare”. When the brightly painted King Arthur Flour Truck pulled into ArtFest Fort Myers on February 5th, the 20-foot long spatula on the roof was pointing toward delightful surprises to come. All weekend, delicious chocolate chip oatmeal cookies, baked on site, were sold for a donation (to a charity of ArtFest’s choosing) AND King Arthur Flour matched the weekend earnings to add to that final dollar amount! “Our weekend fundraiser at ArtFest Fort Myers was one of most impressive on our tour,” said Julie Christopher, Marketing Program Manager for King Arthur Flour. 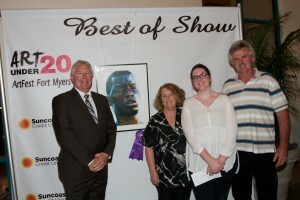 ArtFest Fort Myers awarded $7,400 in prizes to Lee County high school students at the Art Under 20 Award Reception, held at the Harborside Event Center on February 29th. 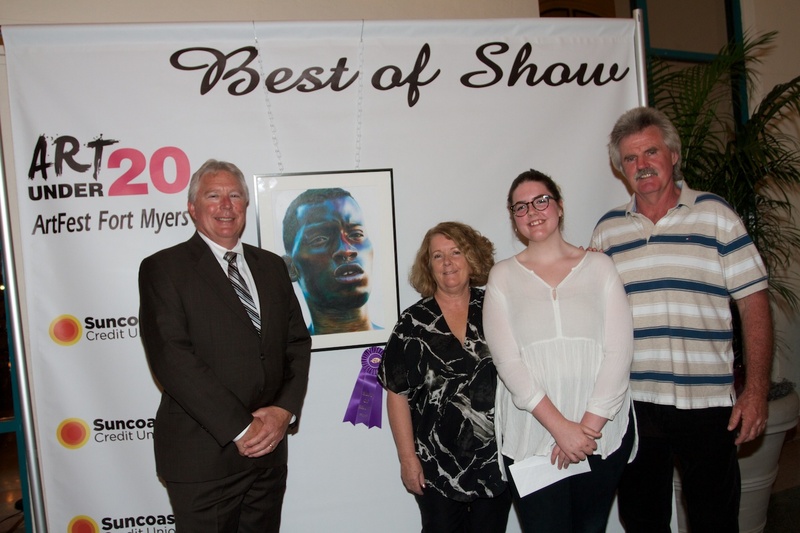 At this season’s Art Under 20, proudly sponsored by Suncoast Credit Union, local high school students representing 18 Lee County high schools entered 293 pieces of artwork. The student art was exhibited at the fine art festival the first weekend in February and was previewed by thousands of festival patrons. Art Under 20 judges, Janice Grau and Todd Babb had the difficult task of selecting the winners from among many talented students. Mr. Greg Pasanen, Suncoast Credit Union Regional Vice President, presented the award checks to the winning students. 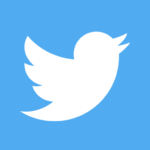 5K. Run or walk, race or fun. At the one and only ArtFest Fort Myers. When announcing Publix Run to the Arts Sharon McAllister, ArtFest Fort Myers’ Executive Director said “This is so much more than any ordinary 5K. Publix Run To The Arts brings together the best that life has to offer: health and fitness, arts and culture, friends and family, and the scenic beauty of the Fort Myers waterfront. In our view it is all about quality of life in our community”. Publix Run to the Arts isn’t just a race, it’s a full morning of fun that kicks off Sunday morning at ArtFest Fort Myers with exceptional art, entertainment, and children’s art activities. Runners and their guests will enjoy live music and be the first to sneak a peek at the artist booths on Sunday morning, even before the festival opens to the public. Join the fun as fabulous artists invite runners to exercise their creativity and create a group art piece. 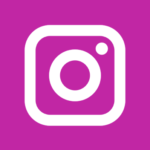 Post-race festivities include a scrumptious breakfast, an interactive “public” art creation, race awards, live entertainment, fabulous door prizes, and much more. Take part in a new Fort Myers tradition – participate in the Publix Run To The Arts! Run to the Arts t-shirt, with beautiful art by ArtFest Fort Myer artist, Callie Gray. Register by January 4th to reserve your size! Post-race breakfast, featuring tasty Publix treats – muffins & bagels with all the trimmings; bananas; yogurt; coffee and a few surprises. Medals will be given for 1st, 2nd, and 3rd place in each age group, plus special awards for male and female overall, masters, grand masters, and senior masters. 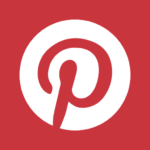 Door prizes including weekends for two at South Seas Resort, Inns of Sanibel; running gear; Theater and symphony tickets; Art classes; gift certificates for great meals and excursions and so much more. Free runners-only parking will be available at West First Street and Carson Street. Park all day and enjoy ArtFest! Professional bib timing services by Endurance Sports Timing, provides results posted as soon as the race is finished. 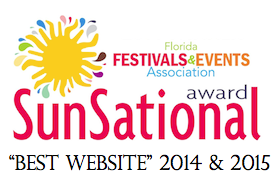 Publix Run To The Arts welcomes non-runners as race day volunteers! All volunteers will get a cool Publix Run To The Arts staff shirt, breakfast on race day, raffle entry, and preferred parking. Run to the Arts is made possible by the generous support of Publix, a 13 year sponsor of ArtFest Fort Myers, who is carrying on its tradition of being the kind of company a community can count on. Publix invites you to start your day with an invigorating run or walk and a healthy breakfast … then feed your mind and spirit at ArtFest Fort Myers. ArtFest Fort Myers, the annual juried fine art festival, takes place February 5, 6 & 7, 2016 in the Fort Myers River District. 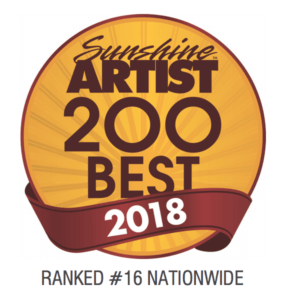 Join the experience with 215 professional artists from across the county and around the world; the largest high school art exhibit and competition in south Florida and free interactive art experiences for children of all ages. Upgrade to the VIP Experience, as ArtFest Fort Myers celebrates their 16th anniversary! Ron Bucher, Vice President, Investments at Raymond James, looks forward to welcoming you to a weekend of all things artfully pampered, beginning with the elite Opening Night VIP Party and continues at the VIP Tent on Saturday and Sunday. Begin Friday evening, February 5, 2016 with special parking reserved just for you and then join us at the VIP Tent on Opening Night. Delectable food from some of our area’s finest restaurants, great wine and ice cold beer are just the beginning, as the evening also includes an extraordinary sampling of 65 festival artists and surprise performances. The VIP Experience is $95 per person and your support contributes to the year-round ArtFest Fort Myers’ art education outreach programs. To enjoy the ArtFest Fort Myers VIP Experience and our 215 artists as a Very Important Patron visit Upgrade To VIP at ArtFestFortMyers.com or call 239-768-3602.